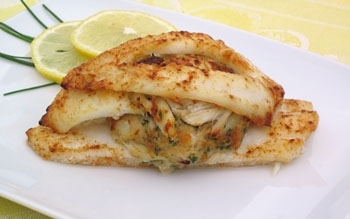 February 18th is National Crab-Stuffed Flounder Day. ** Note, you can stuff any white fish filet with crab meat. Jumbo lump crab meat, the largest, snow-white lumps. Lump/backfin crab meat, the same color, flavor and texture of jumbo lump, but is in slightly smaller pieces. White crab meat, smaller white pieces ideal for recipes where the size and shape of the crab flake becomes indistinguishable, such as crab cakes. Claw crab meat, the reddish-brown claw and leg meat which is actually more flavorful and is preferred by many (who also and appreciate the lower price) and is the best to use in spicy dishes, where the flavor best holds up to the spices.